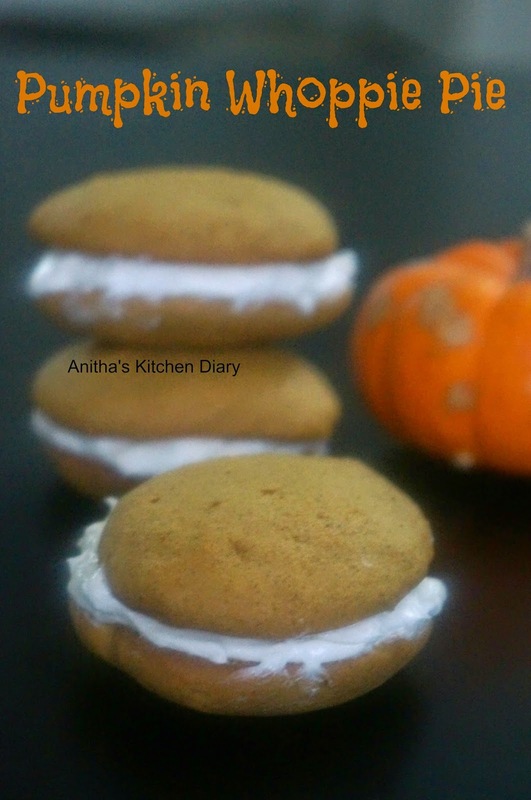 These cookies are moist and soft like cake and sandwiched them with a creamy vanilla filling.These pumpkin whoopie pie are good recipe for thanksgiving day dessert.Linking it to Baking Partner Challenge. Pumpkin puree – You can either use store bought one or make it your own. Cut and deseed the pumpkin. Place it in a baking sheet. Bake it for 30 minutes or until it tender. Check the tenderness by piercing the fork. Preheat the oven to 350 degree F. Grease or line baking sheet with parchment paper. In a mixing bowl using electric hand mixer or stand mixer beat butter and then add sugar beat still creamy and fluffy. Add eggs and beat well. Add vanilla extract, pumpkin puree and beat until combined. Now mix the dry ingredients little by little to the wet ingredients until combined. Drop tablespoon of batter into a prepared baking sheet, spacing about 2 inches apart. With moistened finger or back of the spoon shape the cookies. Beat the Shortening and butter until soft and creamy .Gradually add sugar and beat until light and fluffy. Then add vanilla extract and beat in low speed until combined. Finally drizzle in corn syrup and beat until soft and fluffy. Take one cookie and spread a tablespoon of filling on the flat side of the cookie.Top it with another one.